Not many people are aware that Jakarta is also blessed with romantic tropical islands-get away, far away from busy and noisy city streets. 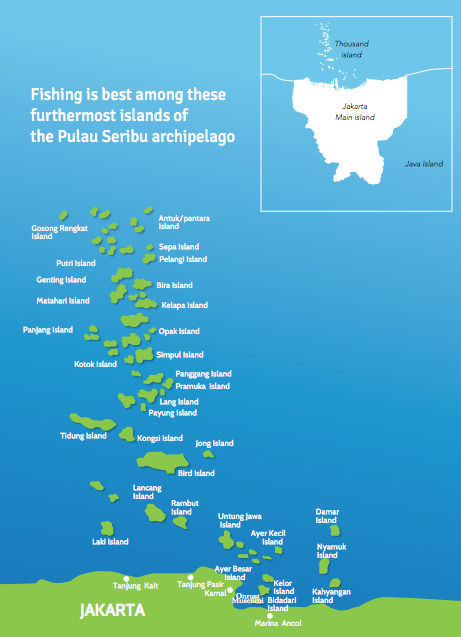 The string of islands that lie in the Bay of Jakarta are known as Pulau Seribu, or the Thousand Islands, which together form the Pulau Seribu National Park. Comprising - not quite one thousand, but some 110 large and small islands, they stretch from the nearest island called Pulau Ayer to those far out into the Java Sea like Pulau Putri, Pulau Sepa and Pulau Hantu. Some 20 islands are tourist resorts, with only 6 islands having local inhabitants. The District capital of Pulau Seribu is at Pulau Pramuka, located right in the midst of this cluster. The Thousand Islands are the natural water and beach playgrounds for Jakarta citizens. Each island offers different types of recreation from just beach combing, boating, jet skiing and snorkeling, to fishing and scuba-diving further out to sea.A number of islands such as Pulau Ayer, Pramuka, Pulau Kotok and Pulau Putri have bungalows for rent complete with facilities to enjoy island life at your leisure. To make your holiday complete, here are also Dutch colonial vestiges to explore in archaeological parks as well as nature reserves for breeding of hawksbill turtles and protection of mangrove forests. Several types of flora and fauna frequently found in the Thousand Islands include coral reefs, starfish, sand starfish, Betok fish (Anabas Testudineus Bloch) and onamental fish such as the Sargent Major fish among others. Regular boats leave Marina Ancol to the various islands at 8.0am and 9.0 am, returning around 1.0 pm or 2.0 pm. Speedboats are also available for rent. There are also special departures to the tourist resorts.